Home Blog Mechanics: Take your Tax Rebate to the Redline! At Brian Alfred, we’re proud to be one of the UK’s leading tax specialists. We’ve helped thousands of happy customers get their tax rebate, real quick. Now, we’ll be sorting out more than just construction workers! Are you a mechanic who pays out for your own tools, uniform or training? Well, we can now help you claim back what’s rightfully yours! Happy days for everyone out there that spends half their time under a bonnet. If you’re looking to swap an MOT for Duty Free, get in touch to discuss your mechanics tax rebate. Take it to the Redline. At Brian Alfred, it’s about getting maximum tax rebates for mechanics, real quick. What can a mechanic claim for? Quite a lot, actually. You can even go back for up to four years. BTW: Do you know a mechanic? Don’t worry: the auto’s running fine. The reason we’re asking is because you don’t need to be mates with Kevin Webster, Cain Dingle or Phil Mitchell in order to refer a mechanic to Brian Alfred. In fact, you don’t even need to be a client of ours! If you know a mechanic who could do with a rebate, then all you need to do is tell them about Brian Alfred. We’ll pay you £50 for every successful referral. For more information, call us on 0800 073 1218 or download our pack to start your claim today. 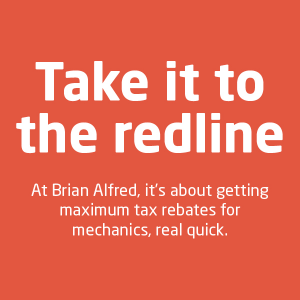 Tax rebates for mechanics that go to the redline – Nice one, Brian!